Publication details: Book. 2011. viii and 84 pages. Publication date: 2011-02-18. with 59 figures and 83 3D photographs. Spiral bound (concealed wire-o). Two separate books packaged in a cassette. 3D glasses included. 17x24 cm (6.7x9.4 in). "This manual is highly recommended, and as entertaining as it is instructive." In this beautiful atlas, Cor Cremers and Jef Mulder have put together the knowledge and experience gained in four decades of practicing and teaching microsurgical procedures. To be able to teach the basic approaches of modern temporal bone surgery using only one temporal bone represents a masterly performance. Since the number of temporal bones available for dissection is becoming progressively scarce, it is clear that the authors have turned a need into a great virtue. The precise text and the splendid illustrations are also an expression of the authors' special talent in conveying essential surgical information in its most concise form. The first seven chapters describe conventional middle era surgical interventions. The following nine chapters deal with surgical procedures involving the complex anatomy of the medial part of the temporal bone. Since the late sixties, the development of lateral skull base surgery has widened the horizon of middle ear surgery. Important medial structures of the temporal bone, such as the jugular bulb, facial nerve, internal carotid artery and middle and posterior fossa dura, which were previously considered untouchable, have changed from enemies to reliable friends. However, the transformation of middle ear into temporal bone surgery requires precise knowledge of the anatomical landmarks, permitting adequate handling of the most hidden structures of the temporal bone. This atlas accomplishes with admirable ease the difficult task to acquaint the inexperienced otologist with the surgical strategies needed to carry out safely the most relevant procedures of temporal bone surgery. The experienced otologist will also find valuable hints on how to solve special problems of his daily work. These goals are reached through the great experience and the admirable didactic skill of the authors. There is no doubt that the atlas will find the success that it deserves. The Nijmegen temporal bone dissection manual is an outcome of the long-standing annual Nijmegen course in ear surgery, which started in 1966. This carefully composed manual has now been made available for use outside the setting of this course. Temporal bones for dissection by trainees have become more and more scarce, so they should be used with utmost care and efficiency. Therefore, in this manual 16 consecutive surgical procedures are described that can be performed on only one single temporal bone. A temporal bone dissection manual needs high quality, realistic illustrations to guide the trainee through the temporal bone procedures. The drawings in this manual are the outcome of a long, excellent cooperation with two artists. The late Mrs. Marlu de Leeuw sadly could not complete this long-term project, but we were fortunate to find Iris Post (www.irispost.nl) willing to help complete it. We deeply appreciate their support. 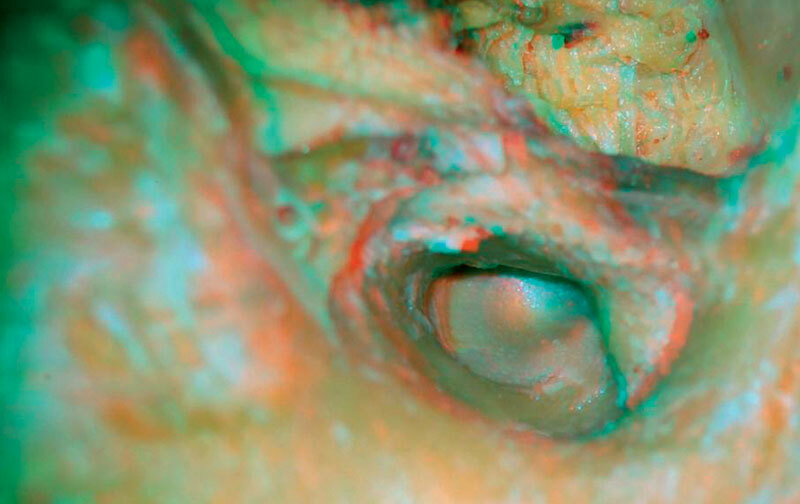 Temporal bone dissection goes from landmarks to other landmarks in a three-dimensional setting. It is the art of the illustrators to provide a three-dimensional view in a two-dimensional plane. 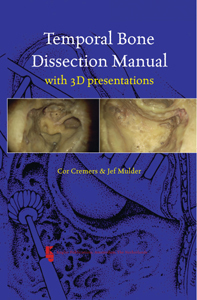 To enforce this even more, this manual has separately additional three-dimensional presentations of dissected real temporal bones to support the trainees in their orientation and thus facilitate the dissection. Besides the most important classical surgical approaches of the temporal bone, we have included some more unusual surgical dissections to help surgeons to get acquainted with these techniques. The variations present in the anatomy of the temporal bones require experienced and meticulous ear surgeons. Training in temporal bone dissections is needed to obtain sufficient experience to become a qualified ear surgeon. The goal of this manual is to be of help in the training of ear surgeons. We are aware that this is an ongoing project and therefore, are grateful for any constructive criticism or helpful suggestions. Finally we would like to express our gratitude to Mr. Alan G. Kerr for the revision of the manuscript. Click here for a review by Prof Dr. Stokroos as published in Nederlands Tijdschrift voor Keel-Neus-Oorheelkunde (in Dutch). Click here for a review by Noweed Ahmad as published in ENT & audiology news. Had this simply been a manual based on over 40 years of running the Nijmegen course in ear surgery, it would still have appealed. The conventional book is indeed a well set out guide to drilling a temporal bone into dust and getting the maximum benefit from what is a scarce resource. There are accompanying monochrome diagrams, nicely labelled without obscuring the images, and the text is a series of clear, stepwise instructions. This is a hardwearing book which will stand up to the temporal bone lab, with spiral binding and glossy (almost waterproof?) pages. It is everything you would expect. The novelty comes in the second book in the blue box, the 3D colour presentations. A few weeks ago, I reviewed a large atlas of temporal bone surgery (by Tuncay Ulug), and commented that, even with the best photography, colours in this field can only ever be shades of cream, brown and black. I felt this topic cried out for 3D imaging - after all, a technology now available on a domestic TV. I gather that Ugo Fisch (who wrote the foreword) pioneered 3D monitoring on his surgical microscope decades ago! The second book in the manual provides over 80 high quality, 3D, colour photographs, taking the reader from the mastoid surface landmarks to the petrous apex. The 3D glasses provided are somewhat fragile, but replacements are inexpensive and widely available. The effect - the illusion of depth - is quite incredible, especially as the cavity deepens and widens. I swear I saw the burr move on the posterior tympanotomy! There are moments of definite vestibular upset, and I would not read this on a Channel crossing. I thought this concept a superb idea. I now await the operative video in 3D, but I suspect that this might prove even more disturbing to the busy otologist: seeing such a lifelike image but being unable to interfere! The Journal of Laryngology & Otology, 1 of 1.